Preheat oven to 350F. Line an 8x8 baking dish with parchment paper or spray with baking spray. Melt chocolate and butter in microwave in 30 second jaunts, stirring between each jaunt. Set aside to cool. In a small bowl, whisk together flour, baking powder, salt, and cocoa powder. In a medium sized bowl, whisk together eggs, sugars, and vanilla. When chocolate has cooled (it should no longer be hot, but slightly warm is OK), slowly whisk in chocolate. Pour into prepared baking dish and bake for 30 to 40 minutes until toothpick comes out with just a few crumbs sticking to it. Remove from oven and let cool completely before icing. While brownies are cooling, whip together icing. Icing: Do not make icing until brownies are ready to be iced. In a large mixing bowl, cream together butter and powder sugar. Add salt. Beat in white chocolate. Slowly add cream until final consistency is reached. Fold in crushed peppermint sticks. 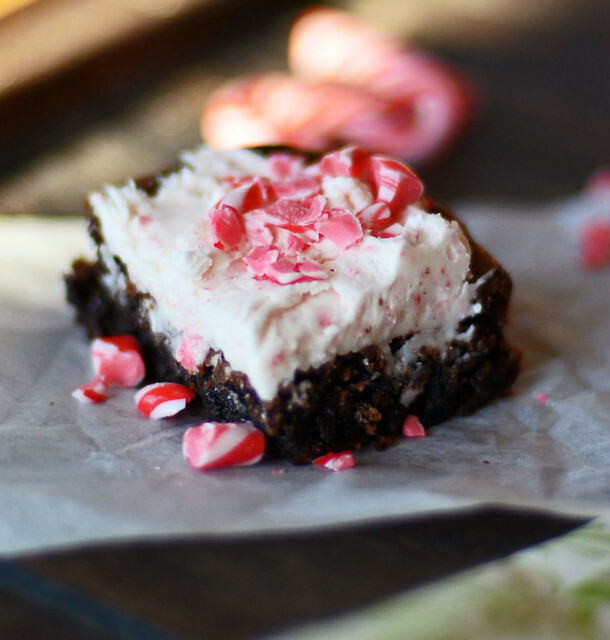 Evenly spread on cooled brownies and top with more crushed peppermint sticks.